The plow cuts under, then lifts, turns and breaks up the soil to prepare it for planting. This is a 3-blade Sulky (Riding) Plow. It was invented in the 1870s and was pulled by horses. The more blades, the faster a field could be plowed. By the 1930s, tractors, with much larger plows and many more blades, do the same work, at much faster speeds. The wood plow began to be replaced by iron in the 1820s. The iron lasted even longer with far less maintenance. By the 1840s the cast iron plow was being used on the majority of farms. In 1837 by the all steel plow invented John Deere. The steel plow shed the soil better than a cast iron plow and had less of a tendency to break when it hit a rock. 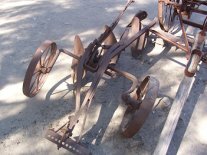 In the 1870s a successful riding plow, called a sulky plow, was developed. This replaced the walking plow as the farmer had better control on the blades and it was less work for him to ride instead of walk. Soon 2 and 3 blade sulky plows were developed. The more plow blades, the faster a field could be plowed. By the 1930's tractor pulled plows replaced the horses and disks replaced the plow blades. The tractors worked faster, as they could pull larger plows, more blades, at a faster speed. Unfortunately, the constant turning and breaking up of the soil allowed for soil erosion by the wind and rain. In the 1960s minimum tillage and no-tillage farming became more popular and the plows became less popular. The plows depth is controlled by the handles which adjust the wheel height. The spring makes the adjustment easier. By using both handles, the depth and angle of cut could be controlled.